This post is sponsored by Stonyfield Yogurt. All recipes and opinions are my own. We’re right at one week away from Christmas and the spirit is flowing in our home. Cookies have been made (and mostly already eaten) and the candy canes are taunting us to create something yummy. 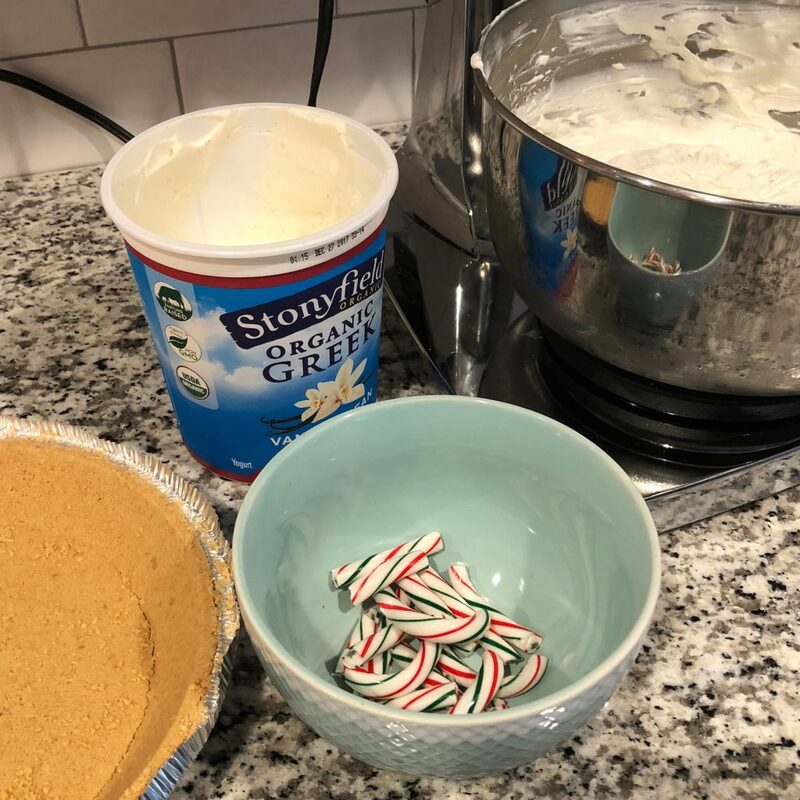 What better way to use candy canes than in a festive candy cane pie! 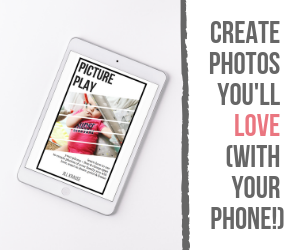 This is a very simple recipe and one that doesn’t require too much planning or prep time. 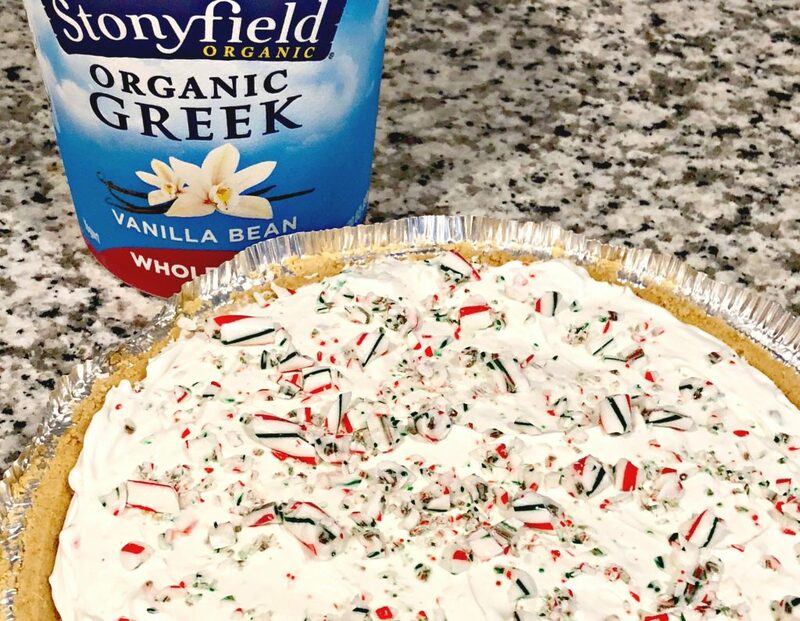 The only ingredients are Stonyfield Organic Greek yogurt (vanilla bean of course), cream cheese, whipped cream, and a pie crust! Oh, and don’t forget the candy canes!! For a smooth consistency I used my electric mixer (referral link to Amazon for the mixer I use) to mix the whipped cream, cream cheese and yogurt. I added a few drops of peppermint extract to make the peppermint flavor more noticeable. 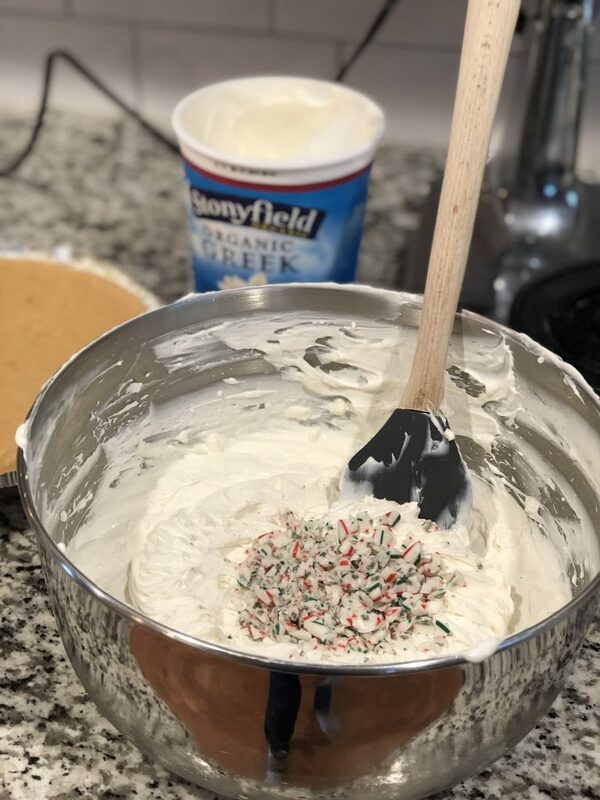 Once the mixture is creamy and blended then you can stir in the crushed candy canes. Then you simply add it to your favorite graham cracker pie crust (although oreo crust would be good too) and freeze until it’s time to eat. I will say that the first time we made this pie we didn’t freeze it and it was still tasty in the fridge. It wasn’t as firm as I would have liked it to have been though and fell apart while eating. The fridge version would actually make an amazing party dip!! Just serve with pretzels or strawberries!! I almost always have Stonyfield yogurt in the fridge, it’s such a great staple item that I use in lots of different recipes and smoothies. We also keep a plain yogurt on hand to replace sour cream from savory dips and topping baked potatoes and tacos! Plus Stonyfield is certified organic and GMO free! 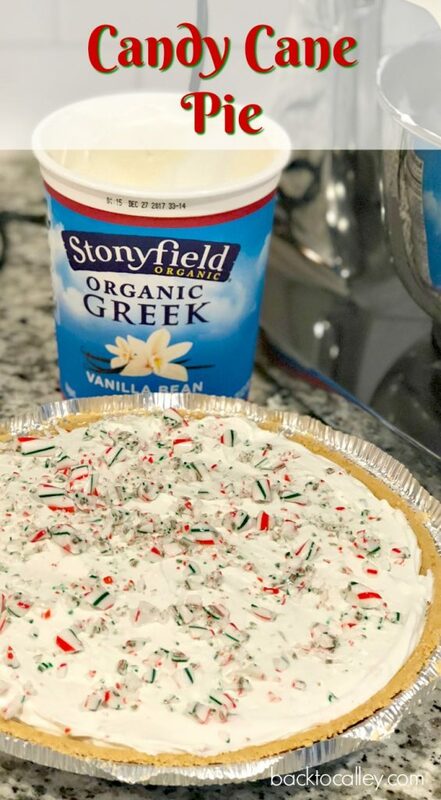 The candy cane pie would be great for a holiday party or anytime you need a quick and easy dessert. …or for breakfast tomorrow morning when I don’t feel like making anything else. Afterall, it’s got yogurt so it’s kinda like breakfast…right?? Next up, laundry and packing for a short holiday getaway with the family. How are you spending your holiday break? What’s your favorite dessert recipe this time of year? What a fun, festive dessert! My kiddo would go bananas for a pie made with candy canes!